Scotland is the only country so far which has raised any questions on the alleged rendition activity on home soil. The Rendition Project is a product of a collaborative research between Dr. Ruth Blakely from the University of Kent and Dr. Sam Raphael from Kingston University, London. Now anyone with an internet connection can understand, view, and track over 11,000 CIA flights detainees may have been aboard between 2001 and 2006 under the US rendition program, a murky operation of secret detention and torture. “Our purpose is to shed as much light as possible on this system,” Blakely told RT. Blakely’s team has compiled a unique database sourced from freedom of information requests, testimonies from detainees, Red Cross reports, courtroom evidence, flight records, and invoices. The data is categorized into four subcategories- flights which definitely had a detainee on board, those which are suspected of having suspected terrorists on board, and ‘dummy’ or test flights, and other circuit flights, all on 122 different US-registered civilian aircraft. “Our main aim was to try and map the global rendition system to try and provide a comprehensive a picture as possible how rendition took place, which countries were involved,” Blakely told RT. Most information was already in the public domain, but Blakely hopes by making it web-accessible, the project will assist human rights investigators and lawyers to defend the rights of detainees who have been victims to unfair torture or questionable tactics. The site will help reveal “how the CIA managed to hide individuals in this system as it transported them around the world to hold them in prisons where they could be tortured and interrogated,” said Blakely. Among those profiled on the website is Abu Zubaydah, a Saudi Arabian currently being held in custody at Guantanamo Bay, without any official legal charge brought against him. 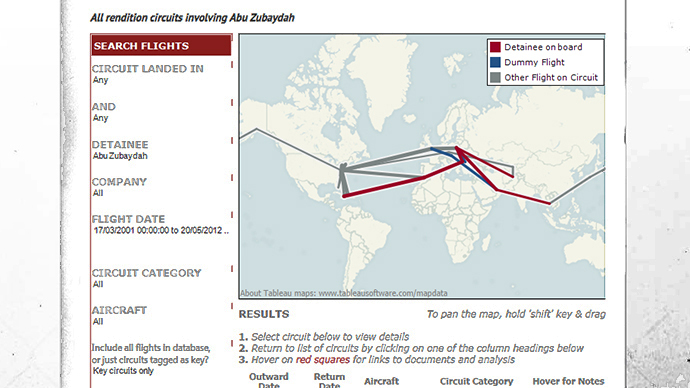 Zubaydah was first captured during the Bush administration, and in 2006 was transferred to Guantanamo. The Rendition Project believes he was first caught in Bangkok, and may been on board eight different rendition flights, as he was transported around the globe to different CIA black spots. A suspected terrorist, Zubaydah claims he was water boarded 83 times during August 2002 while he was held at a US detention site in Thailand. Blakely and her team believe they have found ‘conclusive’ new proof that CIA planes regularly landed at three Scottish airports under the rendition program. Aberdeen, Inverness, and Wick were all allegedly used to carry out secret US missions, according to the website. Blakely’s study shows evident that five flights landed at Wick, five at Inverness and three at Aberdeen, all allegedly part of the US missions. During a question and answer session in the Scottish Parliament on Tuesday, Justice Secretary Kenny MacAskill acknowledged the allegation that his government took part in the rendition program. In an almost empty chamber, Scottish Parliament member Patrick Harvey, a Scottish Green party co-convener, questioned Justice Secretary MacAskill about the alleged touch-downs. 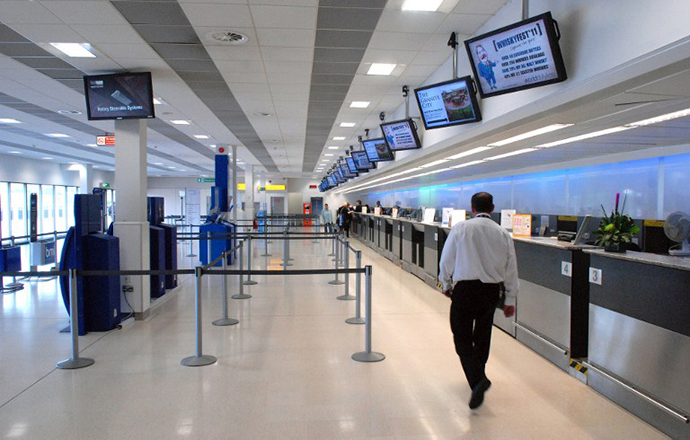 “The Scottish government strongly opposes illegal rendition flights. No representations have been received by the Scottish government regarding these flights,” MacAskill answered. Until there is hard and concrete evidence, according to MacAskill, Scotland will not make any formal accusations against the US or any other involved parties in the flights. The CIA’s black sites in over 54 countries have been allegedly used to detain and torture suspected terrorists, and to hold them in custody before being transported to the prison at Guantanamo Bay and other torture and detention centers worldwide. The EU parliament has previously called upon Poland, Lithuania, and Romania to reveal any ‘black sites’, or airports used to aid the CIA’s secret rendition program. While combat troops have been withdrawn from Iraq, and the Afghan war now involves less US troops all the time, the US is still involved in either fighting or helping some struggle thought to be useful in the “war on terror” in numerous countries. The US Africa Command (AFRICOM) supports “military-to-military” relationships with 54 different African nations. The “war on terror” is used as a justification to project US power and develop relationships with numerous national military forces throughout the globe. The Obama administration has embraced targeted assassinations and expanded drone attacks far beyond those of the Bush era. Most expanded operations involve small numbers of troops that may barely register in the media or the public mind. For example, in February, 100 US military personnel were deployed to Niger, to assist in intelligence collection to aid the French in their operations in neighboring Mali.Troops have also been sent to Jordan in small numbers but could be significantly expanded. A number of troops have also been sent to South Sudan, Democratic Republic of Congo, and the Central African Republic in connection with attempts to apprehend Joseph Kony of the Lord’s Resistance Army (LRA). Obama officials might argue that all of these operations are just a single conflict, the war on terror–although officially the term “war on terror” is no longer used. The president has the authority to order the operations through the Authorized Use for Military Force (AUMF) law passed shortly after the 9/11 attacks. In other situations the actions could be defended by classifying them as not combat roles at all since the US military operates as advisers who help the military operations of allied forces.